Raleigh, N.C. – Members of the North Carolina General Assembly received a legislative briefing on widespread flooding after Hurricane Florence from state Agriculture Commissioner Steve Troxler and officials from the state Emergency Management Division, Department of Transportation, and Department of Health and Human Services on Monday at 2:30 p.m.
State House Speaker Tim Moore (R-Cleveland) was en route by airplane to New Bern, N.C. with Governor Roy Cooper and other state officials to tour disaster destruction and a shelter in that region. General Mark A. Milley, the Chief of Staff of the U.S. Army arrived at the state Emergency Operations Center today and Kirstjen Nielsen, U.S. Secretary of Homeland Security, is touring damage in Kinston, N.C. with state Department of Public Safety Secretary Eric Hooks. While yesterday North Carolina had eight counties with federal disaster declarations approved, ten more are now approved thanks to FEMA. Bladen, Columbus, Cumberland, Duplin, Lenoir, Jones, Robeson, Sampson, and Wayne counties are among the new additions. Two more federal disaster declarations were requested for Hoke and Scotland counties, and there may be others added as time goes on. Officials from the state Emergency Management Division (EMD) said in an operational overview that state Emergency Operations Center remains fully activated at Level 1 with a full complement of state and federal partners. Rain is moving out of state which is positive. However, EMD is still in response mode even though the weather is improving, they still have major response operations in the field. They have pivoted from a southeastern North Carolina impact to a two-front event, making sure they look to the west and central parts of the state as well. EMD is working with field operation teams and partners at local levels to make sure those impacts felt in other parts of the state have adequate resources before they direct them to the east. While EMD has started recovery operations, with the federal disaster declarations in place they are starting to look ahead to the critical need for economic services, they are out doing damage assessments with FEMA on those recovery needs, but while recovery is underway, response is ongoing. Currently 88 counties have local states of emergency with approximately 104 shelters and a population of about 14,000 in those shelters.. Power outages dropped from the high-800,000s yesterday to about 465,000 today. Private sector partners and state-level partners are continually moving resources in to drive that number down. It is still a significant amount of people without power and impacts are moving west with major needs are out there, but a significant improvement from yesterday. The operational focus of EMD remains on life safety search and rescue and swift water teams as flooding continues. There have been approximately 2,500 encounters by those rescue teams, whether a full blown evacuation or assisting local agencies to help move people out. Those boat and air crews are working a lot. They have more work to do and will continue to do it. They are out there working as quickly as they can. Sheltering, general population and medical remain long-term response items for EMD as well as making sure private sector partners and utilities are supported as we try to get infrastructure back online. EMD continues to survey high-risk dams and hog lagoons, coal ash ponds and are working with state partner agencies and infrastructures as far as risks associated with those. There was an event event at Brunswick Nuclear Plant but not the result of any breach or release by the plant, it was due to limited access to the plant. The plant’s reactors are turned off, are not active, so there is no life safety or threat to health at that event. THE Nuclear Regulatory Commission and FEMA representatives at the state EOC followed all appropriate actions to address that issue. Officials from the state Department of Transportation (NCDOT) briefed lawmakers next. Currently there are roughly 2600 NCDOT employees up actively working in addition to 243 contractors assisting them right now. They remain in recovery but the big focus today has been Brunswick County because they cannot access the county. NCDOT is trying to find routes to get into Brunswick County from South Carolina to bring fuel and allow power to come in and support that mission. Another part of that effort to get fuel and resources to Brunswick County is at Cherry Branch where they are readying 3 vessels tomorrow morning to head to Southport. Each vessel will have 1,500 gallons of gas and one tanker of diesel in addition to more crews to do cut-and-shove vegetation work to clear roadways and assist with restoring power back to that area. To-date NCDOT has had 1,618 total road closures. They have been able to reopen about 572, leaving over 1200 closures still remaining. They’ve been fortunate in some areas where closings were simply from flash flooding that receded without much damage. 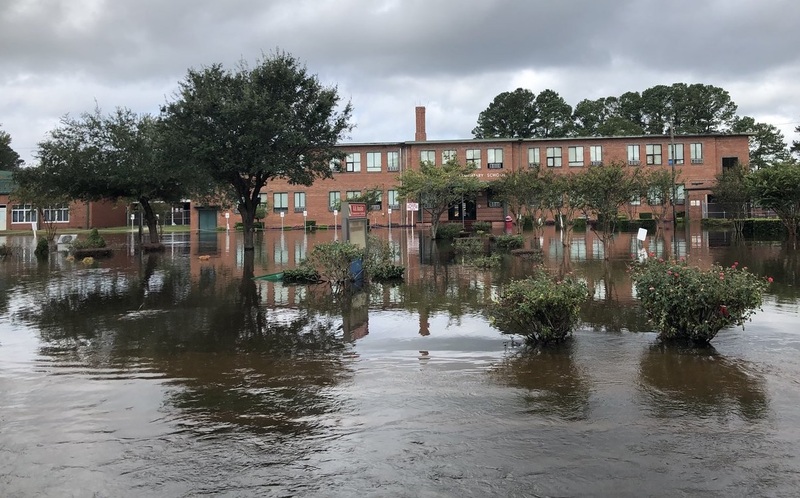 A lot of the 1200 current closures are in south-central North Carolina, Division 8, the Southern Pines and Rockingham area, Fayetteville and of course New Bern and Wilmington regions. In addition to that we still have major interstates, roughly 6, facing closures right now. I-40 and I-95 are the big ones, and I-74/73 just north of Rockingham we’ve had to close it as well. If anyone hears I-795 is closed that’s not true, there was a portion that had water on it but it’s not closed. The transportation system is extremely dynamic and fluid at this point, so NCDOT strongly discourages returning to the region unless for emergency purposes. 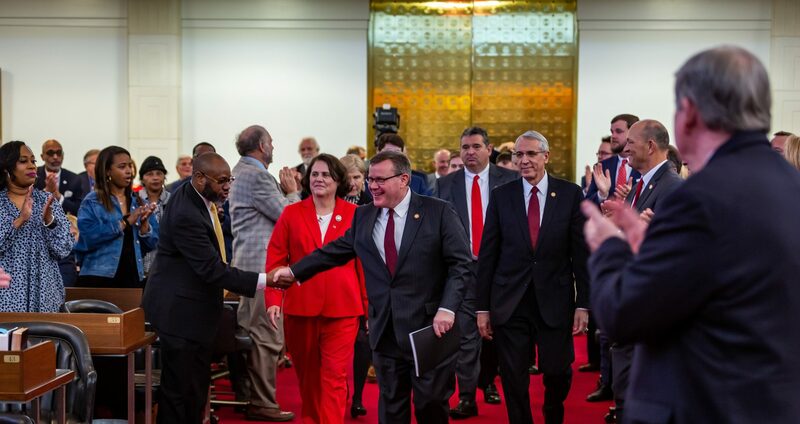 Dr. Elizabeth Tilson Tilson, the State Health Director and Chief Medical Officer for the N.C. Department of Health and Human Services (DHHS) also briefed lawmakers. DHHS is trying to address immediate needs and look forward to marathon preparation in coming weeks and months. They’re trying to figure out and get flexibility in programs we have to help basic needs. They are doing work to get flexibility in food and nutrition services in Medicaid program. Two examples were in a DHHS press release that went out today, two flexibilities in service programs applying to all 100 counties and over 600,000 households statewide. They got a hot food waiver effective through October 31 meaning North Carolinians with food assistance programs can purchase hot food, including food for immediate consumption with EBT benefit transfer cards, that may be available for all retailers that accept EBT cards. This allows people without electricity and power on food assistance programs to have hot meals. Also, they issued a lost food waiver so agencies can issue replacement benefits for people who get the waiver. They are also working within the WIC program, where 51 of 84 clinics are closed across the state, affecting over 100,000 women and 30,000 infants. The statewide E-WIC system provides an electronic card, so remote issuances are available for closed clinics to load another month of benefits to a beneficiary’s card without coming to a clinic. They are seeking other flexibilities for WIC too. Currently there are about 146 shelters open with a population of about 14,000 and a capacity of 50,000, so they have lots of availability. The fourth medical shelter is open now in Charlotte as well as in Goldsboro, High Point, and Clayton. The best way to get in those is to go through local emergency management services, DHHS just sent new guidelines to providers regarding those referrals. DHHS continues to stay in contact with hospitals and health care facilities to know where they are with staffing, food, water, power and supplies, and those facilities are staying in touch with local emergency officials. The mobile disaster hospital in Kinston has seen 10 patients and is staffing up so should continue seeing more patients there. Federal ambulances are coming in to relieve local EMS. Long-term staffing anticipates need for nurses not just immediately but long term, several mechanisms in place to coordinate that. Public health teams are working with other states to recruit nurses and getting a good response, the problem is getting them to where they need to go, a team was turned around trying to get to Cumberland Vounty. Other out-of-state nurses asked to go through Red Cross due to licensing issues. For in-state nurses, two mechanisms for deployment through the NC Nursing Association were sent out yesterday, including using the statewide online system NC-TERMS to get registered and deployed as a team. For one or two independent nurses, they should go through the American Red Cross. This is a stressful time for a lot of people as well, disaster distress hotline is 1-800-985-5990 and is a 24/7 hotline for crisis counseling, there are a lot of potential mental health crises. Storm-related deaths continue to occur so public health messages must continue to get stressed on avoiding driving or walking through floodwater and preventing carbon monoxide deaths so lawmakers should continue to stress those messages. Turn around, don’t drown, the threat of electrocution from downed power lines and generators is also severe, like the threat of carbon monoxide poisoning. Don’t use gas powered generators inside or in closed spaces. The threat of illness from contaminated food is also growing, so don’t eat food that’s been in flood waters and throw away food that went unrefrigerated. When in doubt, throw it out. Go on NC DHHS website they have a Hurricane Florence page as a one-stop-shop for important health information and contact information. N.C. Agriculture Commissioner Steve Troxler briefed lawmakers next. Commissioner Troxler said they began to gear up emergency operations last week and thanks to an early emergency declaration and Executive Order 52 (waiving driving restrictions for truckers) it gave them more prep time. “I don’t know any of us were prepared for what we’re seeing now, another storm of historical proportions, but that prep time was crucial for how many crops we got out of the field and prep for the livestock industry,” Troxler said on the call. Every division in the agriculture department is involved in one way or another in the recovery effort, things people don’t think about like inspectors going into facilities that have food like grocery stores to make sure they’re safe. Emergency programs have incident management teams whose primary task is working with the livestock industry and farmers to determine their needs and keeping animals alive on these farms instead of having animal mortalities. That includes delivery by high water vehicles, boats, air, delivery of diesel fuel for generators, feed, and water – that is paramount. Assessments continue on livestock mortalities that are equal to or slightly surpass Matthew because of higher crest of rivers and basins in farm areas. That assessment will be continuing. The N.C. Agriculture Department has been working very diligently to assist companion animals from shelters as well, rescues, those kinds of things, that’s another major thing they have taken on. Coordinating with federal groups to move pets to shelters, they mainly help with facilitation to try to get those groups in the right place and to move those pets to shelters farther west, especially to the N.C. Fairgrounds in Raleigh, where the Holshouser building is full of animals that came from county shelters. They’re also concentrated on livestock mortality and disposal after the event is over with and they know what they’re dealing with. The department did innovate things with Matthew like in-house composting they’re working with FEMA on again, including other requests from FEMA that are still developing. This is a very fluid event and N.C. Agriculture Department has been unable to get to a lot of areas because water impacting roads leading into farms. They haven’t been up assessing with air assets yet because of the weather. They are transferring two more helicopters from Hickory to Sanford and Kinston is and hope to get up and do assessments tomorrow. After that they’ll have a much better idea on what they’re doing. One vital function they perform is the food distribution division delivering truckloads of food for disaster relief efforts, especially USDA food that they have in the Salisbury and the Oxford area, so they’re busy and are going to continue to be that way. 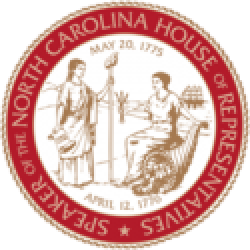 Details of legislator briefings on Tropical Storm Florence were also released to the public on Monday, Wednesday, Friday, Saturday and Sunday of this week by the office of North Carolina House Speaker Tim Moore (R-Cleveland). Next PostNext Speaker Tim Moore Talks Hurricane Florence Relief from New Bern, N.C.